he Environmental Protection Agency (EPA) held several public hearings in October in order to collect public comments on its revised Yucca Mountain radiation standard. Both supporters and critics of the radiation standard turned out to voice their concerns at a series of five hearings held in Amargosa Valley, Las Vegas, and Washington, D.C. A court ruling in 2004 overturned EPA’s original rule and sent the agency back to thedrawing board to develop a new radiation safety standard for the proposed repository. In August of this year, EPA unveiled its new rule, which includes a two-part standard. Under the new rule, the surrounding population cannot be exposed to more than 15 millirems of radiation for up to 10,000 years. After 10,000 years and up to the one million year mark, the exposure limit is raised to 350 millirems. EPA must collect and consider public comments before issuing its final versionof the rule. Ian Zabarte, a spokesman for the Western Shoshone, also testified at the October 5th meeting. According to Zabarte, the EPA’s new standard does not take into account the lifestyles and diets of Native Americans who thrive off the land and value the Yucca Mountain site as sacred. “Right now, a particular class of people are being disenfranchised,” he said. Several critics testified that EPA should strike down its current proposal and produce a standard that would extend the protections for the first 10,000 years to the one million year mark. Critics also advocated for a more stringent standard for groundwater. Lois Gibbs, executive director of the Center for Health, Environment, and Justice, testified at the Washington hearing. She argued that the two-tiered standard is not protective enough in the post 10,000-year period. “EPA’s proposed standards do not prevent serious harm, they cause serious harm,” Gibbs said. Steven R. Kraft, a representative of the pro-Yucca Nuclear Energy Institute, testified at the hearing in Washington. According to Kraft, extending the radiation standard beyond 10,000 years is not a good idea. “Implementation of the disposal program should not be delayed while scientists, engineers, and regulators speculate about what might happen one million years from now,” he said. Eureka County submitted written comments stating that, “The (EPA) rule should be written to protect public health and safety rather than to accommodate the many flaws in the site, and the site’s inability to contain the radiation.” EPA has not indicated when the final rule will be issued. The Department of Energy (DOE) announced in October that it is taking a “new path” to improving safety and performance at the proposed Yucca Mountain repository. According to DOE, this new shift in design means the repository will be operated as a “clean” or non-contaminated facility. According to Paul Golan, acting director of DOE’s Office of Civilian Radioactive Waste Management, “our new plan forward will provide clear direction to improve safety and reliability as well as reduce programmatic risk.” The change in design is also intended to simplify the licensing process. The Nuclear Regulatory Commission must grant DOE a license for a repository at Yucca Mountain before construction and operations can begin at the proposed facility. The new canisters have yet to be designed. DOE did not provide an estimate of how long the new canisters would take to design, or whether this design shift would effect the repository project’s timeline. The Department of Energy (DOE) has announced that the license application for the Yucca Mountain repository faces additional delays. According to DOE spokesman Craig Stevens, there is as of yet no specific date set for the submission of the license application for the proposed nuclear waste repository. “The process is going to drive the schedule now,” he said. “I wouldn’t even talk dates at this point.” According to Stevens, there are numerous pre-licensing matters that must first be resolved. The Yucca Mountain site must be granted a license by the Nuclear Regulatory Commission (NRC) before DOE can move forward with the construction and operation of the proposed facility. NRC is a federal agency that regulates all of the nation’s nuclear facilities, with the exception of the nuclear weapons complex. The license application was originally slated to be submitted to NRC in December of 2004. However, various legal and financial complications have forced DOE to move the target submission date back at least twice. One issue that must be resolved before DOE can submit the license application is the preparation and release of research documents. Under NRC rules, DOE cannot file the application until six months after it has publicly released all background documents supporting research on the Yucca Mountain Project. The documents must be prepared electronically and released on an internet database known as the Licensing Support Network (LSN). DOE originally attempted to issue database certification for the LSN in June of 2004. However, the State of Nevada challenged the database, saying DOE had left out millions of pages of documentation in the rush to meet its deadline. A three-judge NRC licensing board agreed with the state and ordered the Energy Department to fix problems with the database before again seeking certification. Over the past year DOE has been sending thousands of documents to the NRC for inclusion in the database. DOE and NRC have agreed that the new documents will not be added to the LSN and available for public viewing until DOE gives permission. Once DOE submits the license application to NRC, the commission will have three years with a possible one-year extension to review all of the material before deciding whether to grant a license for the construction and operation of a repository at Yucca Mountain. The Department of Energy (DOE) held hearings in September in order to collect comments on the proposed land withdrawal for the Caliente rail corridor. The land withdrawal will allow DOE to continue its studies for the environmental impact statement that must be prepared for the proposed corridor. 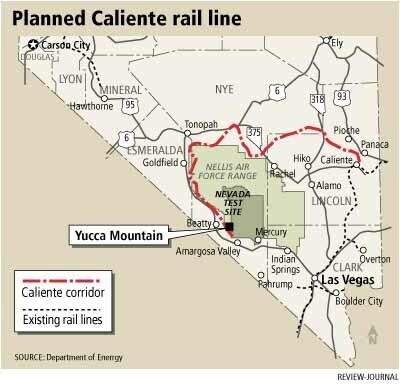 In April of 2004, DOE selected the Caliente corridor over other alternatives as its preferred location for the construction of a rail line to transport nuclear waste to the Yucca Mountain repository. In August, DOE announced plans to withdraw 308,600 acres of public lands in Nevada for up to 20 years. Once withdrawn, the land in question would be restricted from surface entry and mining. The withdrawal would also prevent the Bureau of Land Management from selling property on the parcels. In December, BLM announced that it approved DOE’s request, but only to study the land. IF DOE wants to build the rail line, DOE must apply again. During the study period, engineers for the Department will conduct field surveys and photograph land features to identify a specific route for the railroad within the corridor. NRC Approves PFS UT Nuclear Waste Storage Plan . . . The Nuclear Regulatory Commission has approved a private company’s plans to store nuclear waste on the Goshute Indian Reservation in Utah. Private Fuel Storage, a consortium of nuclear utilities, wants to store 44,000 tons of nuclear waste at the proposed facility while awaiting the opening of the Yucca Mountain repository. Lawmakers agreed in November to cut spending on the repository project to $450 million in 2006. This amount was well below the $577 million allocated to the project last year. The amount also failed to meet the budget request of President Bush, who asked for $650 million for the project. Golan takes helm of OCRWM …. DOE’s Office of Civilian Radioactive Waste Management is now led by acting director Paul Golan, who was assigned to the post in April by Energy Secretary Bodman. Golan, a former Navy officer, has worked to instill in OCRWM an “accountability culture.” Recently Golan has spearheaded a shift in the design of the repository to a “clean” facility (see related story above). If administration nominee Edward Sproat is confirmed as director, Golan will likely remain as principal deputy secretary. ( Las Vegas Sun 9/9/05, 11/10/05; Nuclear Engineering International 9/14/05) …. DOE doubles Caliente rail cost estimate …. The price tag for the 319 mile Caliente route is now $2 billion, including building rail yards and maintenance features along the way. Previous estimate in the EIS was $880 million (LV Review- Journal 12/7/05) DOE halts some work at Yucca….